The new means to visit the city! 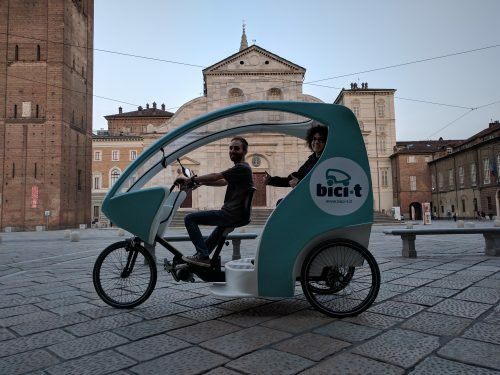 Bici-t is the new sustainable tourism service to discover the city on board pedal tricycles. 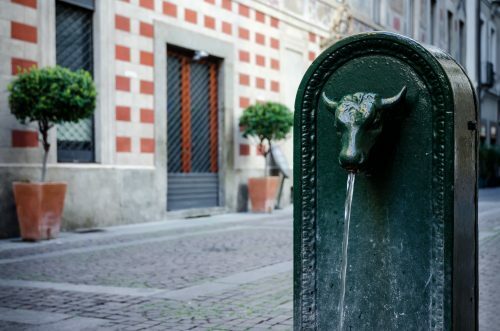 An original, ecological and comfortable way to visit Turin. Thanks to the audio guides, available in Italian, English and French, you can discover the history and the symbolic places of the city, from the Mole Antonelliana to Piazza Castello, from the Duomo to Piazza San Carlo, from Via Roma to Piazza Vittorio Veneto, while comfortably seated, accompanied by one of our riders or by renting the vehicle to move independently. Bici-t offers tours of different lengths, to taste the atmosphere of Turin and discover the main points of interest of the city center. The tours, accompanied by the audio guides in Italian, English and French available on tricycles, are Turin in 60 minutes and Turin city center + Castello del Valentino which lasts 1 hour and 45 minutes. Custom tours on request. The tricycles of Bici-t are pedal assisted, can carry two adults plus a small child, in addition to the pedal. You can rent them for hours or for the whole day, to visit the city on suggested itineraries or to enjoy the Turin atmosphere independently. 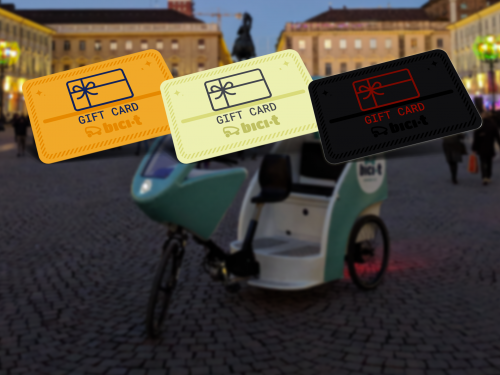 Give a Bici-t Gift Card and let the atmosphere of Turin live. Do not miss the opportunity to impress with a unique gift that will make the big ones come back and entertain the children. It is valid for 1 year.